You can save both time and money on airport parking at Des Moines International Airport (airport code DSM). Simply need to pay online for your first day of parking at Des Moines International Airport in order to secure a spot. Then on the day of your flight, you drive your car up to the lot at the scheduled time, drop it off and take the free shuttle directly to the airport. The airport is south of the city center, on Fleur Drive. 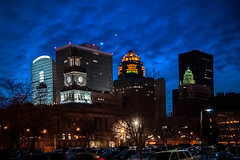 Continental Airlines, Delta Air Lines, United Airlines, Allegiant Air, American Airlines, Midwest Airlines, Northwest Airlines and US Airways all fly to and from Des Moines. The Des Moines airport does not offer international flights, but it was still given the “international” distinction in 1986 due to a U.S. customs office being at the airport. Capitol News and Gifts will provide your last minute reading, while Java Coast Coffee Shop, Creative Croissant Deli, UNO Chicago Style Pizzeria and American Grill will satisfy you at the food court. For up-to-date traffic information, check out the DM Metro Trip Guide here. Taxi: The airport is served by five different cab companies. Bus/Shuttle: Bus service is available to and from the airport Monday through Friday, via the Des Moines Area Regional Transit (DART). Planning a long drive to or from the airport, or an odd-hours flight? Check out Des Moines Airport (DSM) park and sleep hotels. Don’t fancy driving to the airport? Or leaving your car there and paying for parking? Catch a shuttle to Des Moines airport.